Of growing popularity is a series of shorter Pulse Surveys to ensure you don’t miss a beat and to complement any Annual or Bi-Annual Engagement Survey you might be running. With the proven cultural and financial benefits of a highly engaged workforce, it’s crucial to have your finger on the pulse of the sentiment within your organisation all throughout the year. 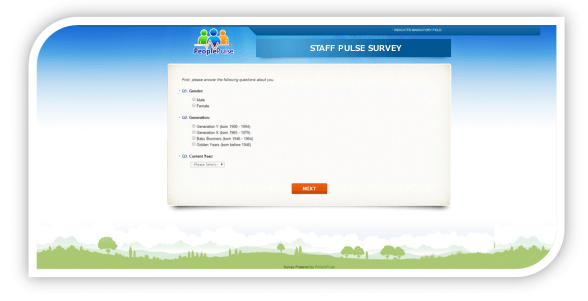 A Pulse Survey is a quick, regular check-in with your employees. Just like Engagement Surveys, Pulse Surveys provide insights into employee engagement and help highlight opportunities for improvement by measuring topics such as satisfaction, job role, relationships, remuneration and benefits, and work environment. Engagement vs Pulse Surveys – what’s the difference? much shorter – they’re quick to complete and to the point. Often no more than 10 questions. conducted on a more regular basis: e.g. monthly or quarterly. useful for focussing on a limited, targeted set of questions relating to current objectives. Pulse Surveys are also a great technique for evaluating the response to any major organisational change in order to highlight successes and any concerns. What are the benefits of a Pulse Survey? Strike while the iron is hot: While Annual Engagement Surveys provide detailed insights, so much can happen in between, and waiting 12 months to find out can be risky. That’s why organisations are adding Pulse Surveys to their arsenal: to stay on top of trends and keep a finger on the pulse of emerging issues – and opportunities – before it’s too late to act. Boost engagement: Pulse Surveys are an easy and effective way to nurture a ‘culture of asking’ which itself can improve employee engagement. The higher frequency reminds employees regularly that their feedback is valued – that their opinions count, and provides an opportunity to communicate current goals. have faster feedback cycles – making them a perfect complement to more detailed annual surveys by giving you near instant insight into whether projects aimed at improving engagement are working. provide a more granular measure of improvement over time; rather than comparing feedback over years, you can see it rise or fall via monthly / quarterly increments. can be used to check in with a particular employee group, e.g. location or function, especially after any major changes. often have higher completion rates. can be used as a powerful employee relation tool, providing an opportunity to increase awareness among employees about current goals. Get everyone onboard: it’s important that everyone, from the CEO, to management, to your employees, understand the importance and benefits (for them!) of a Pulse Survey. It’s important that management is invested as they have the ability to make positive changes – which benefits employees as well as the organisation as a whole. Call the experts: Work with a Survey Expert to develop the right questions and ensure your survey results provide actionable insights that align with your original goals. Using a third-party company such as PeoplePulse to run your Pulse Surveys, and communicating this to your employees, can also assist in gathering more open feedback. Communicate: Before introducing a regular Pulse Survey, it’s highly recommended that you prepare your employees via Pre-Survey Communications. This is to try and get everyone onboard with why they’ll be receiving the survey, helping boost open participation from the outset. Identify: Identify in advance whether the majority of your workforce will be at a Desktop PC, or on a Mobile Device. ‘PeoplePulse Mobile Surveys’ are a perfect solution as they automatically detect the respondent’s device and serve the Desktop/Mobile friendly version of the survey as appropriate, with the option of using Email and/or SMS invites. Reassure: To aid with gathering more honest answers, provide anonymity and, importantly, communicate this fact to your employees. Work with a Survey Expert to implement tried-and-tested messaging in survey invites and on the survey Introduction screen. Share the results: a culture of open communication and transparency improves engagement with the survey process, and in general. PeoplePulse’s Reporting Suite gives you the power to choose how much is shared with each employee group, from high-level trend reports by theme, to highly granular comparative reports. Follow-up: there’s nothing worse than being asked to give feedback and not knowing what, if anything, is being done with it. Schedule a follow-up communication, perhaps a thankyou and some aspect of the survey results themselves. Importantly, let your employees know what improvements are being made based on their feedback: that’s how they’ll know it matters! Our Project Managers have extensive experience in the set up and delivery of best in class Staff Pulse Projects. Their role is to ensure your engagement survey runs in an efficient and effective manner from start to finish. Utilise our proven Staff Pulse Survey templates, bring your own questions, or use a mix of both. This combination of exceptional software and unmatched support & advice works to ensure that your Staff Pulse Survey is set up professionally without fuss, and that ultimately your survey delivers you the insight you need to make better business decisions. My Project Manager is always only a phone call away and always willing to assistance. She has good system knowledge and is a pleasure to deal with. Very cooperative and quick to assist as required. This is the second survey I have worked on with my Project Manager and once again she has been great. She’s always very flexible and able to accommodate if survey requirements change and always delivers to deadlines. I always have great confidence that the end survey outcome will be a success. 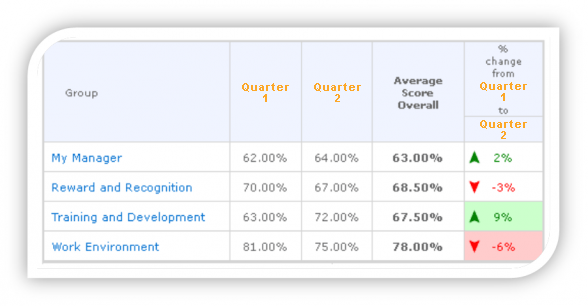 My Report Insights Specialist had a great communication style and clear dedication to project.